Traditionally in India, manholes for providing access to telecommunication and sewer lines have been made from bricks. However, brick manholes are time consuming to build and are not structurally strong. 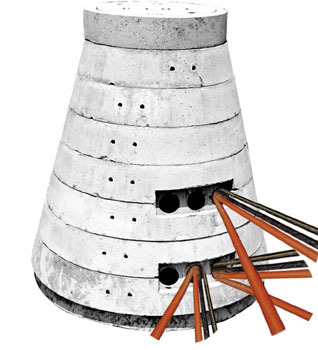 Recognizing these problems, KK developed and introduced the conical manhole assembly system. The conical manhole assembly system has now being overwhelmingly accepted by the telecom majors and is the predominant system used to provide access to underground telecom cables. 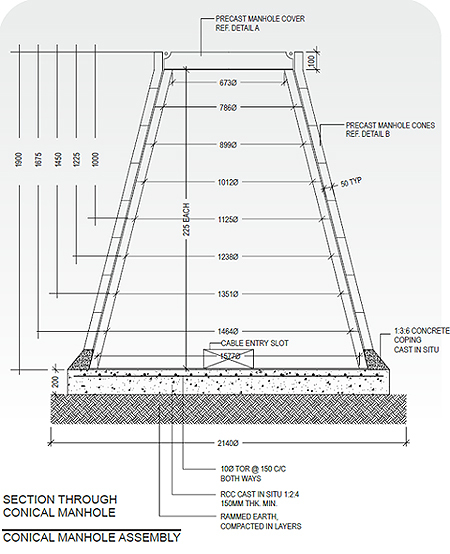 The conical manhole assembly system consists of conical rings (each of height 225 mm) made from precast reinforced concrete that can be stacked one on top of the other to construct a conical shaped manhole. In addition, a precast concrete frame and cover are also provided at the top. This system allows the flexibility to customize the height of the manhole to suit the application. Based on the number of rings used, the height of the manhole can vary from 0.5 meters (3 rings) to 1.9 meters (15 rings). In telecom applications, conical manholes of height of 0.5 meter, 1 meter, 1.225 meter, and 1.45 meters are primarily used. Each ring is reinforced with 2 nos. 8 mm dia torr steel rings and 8 mm dia stirrups at 150 mm c/c/ along the periphery while the cover is double reinforced with 8 mm dia tor steel at 100 mm c/c in the first plane and 8 mm dia tor steel at 50 mm c/c in the second plane. At first a pit a dug in the desired location. The size of the pit depends on the size of the manhole. The conical manhole is assembled on top of the PCC. Each ring is lifted using the holes provided and lowered into the pit. Telecom or Power cables are introduced into the manhole through the holes provided. Subsequently, the hole are sealed with mortar.